This Peanut Butter Pretzel Puppy Chow recipe is going to change your puppy chow world. 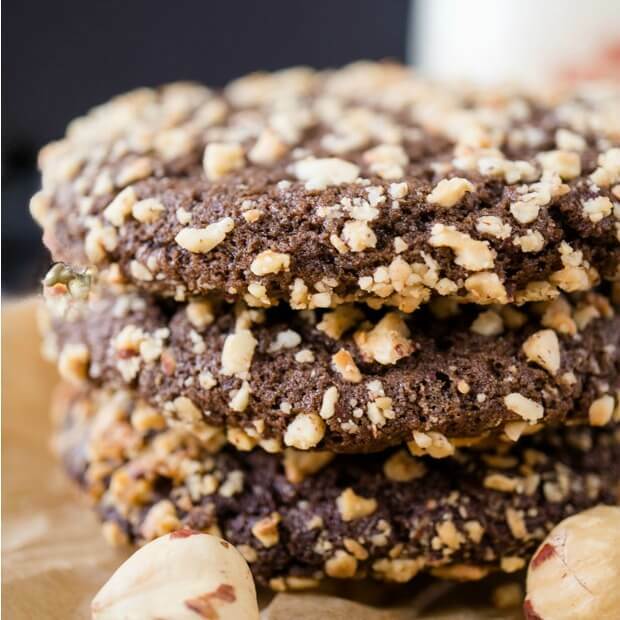 They’re sweet, crunchy, and satisfy that peanut butter craving! 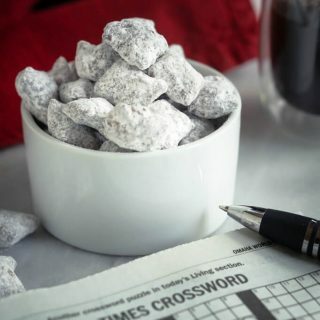 Think you know puppy chow? Think again, this Peanut Butter Pretzel Puppy Chow recipe is going to up your puppy chow game forever. #GameChanger! I’ve been making puppy chow for a LONG time. My children made it in pre-school when food was allowed in school that long ago. I’ve been seeing some new versions on Pinterest but none that made me change my ways until this Peanut Butter Pretzel Puppy Chow recipe! 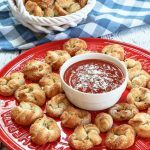 We love finger food snacks like this and it’s perfect to have on hand when you’re entertaining. I like to set out appetizers, snacks, and desserts that people can help themselves too. I also think that this Peanut Butter Pretzel Puppy Chow is going to be an eye-catching addition to my cookie tray this year. 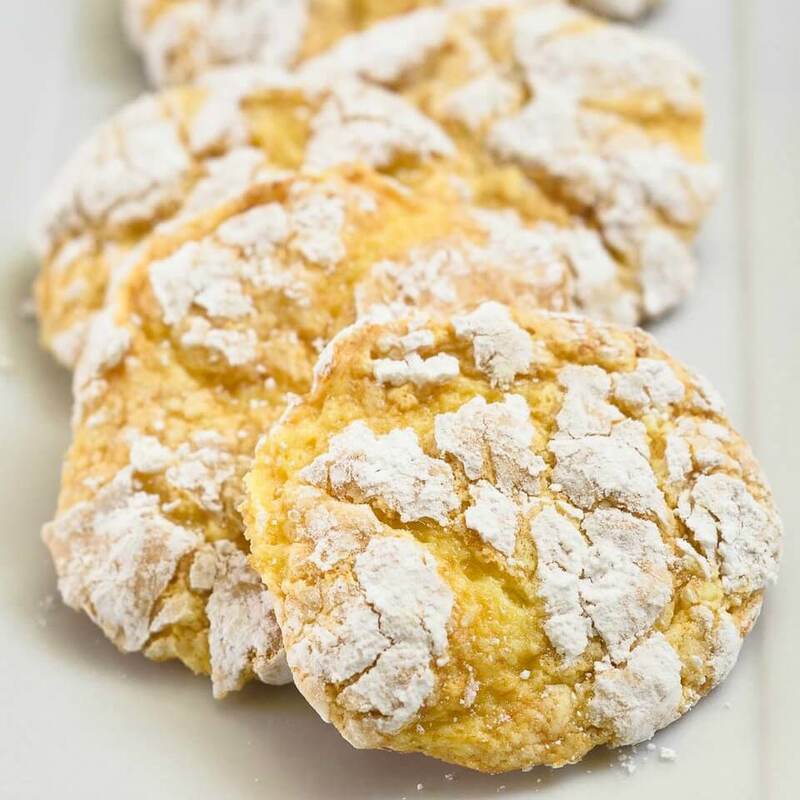 Do you ever go to those holiday cookie exchanges and wonder what the heck is that? 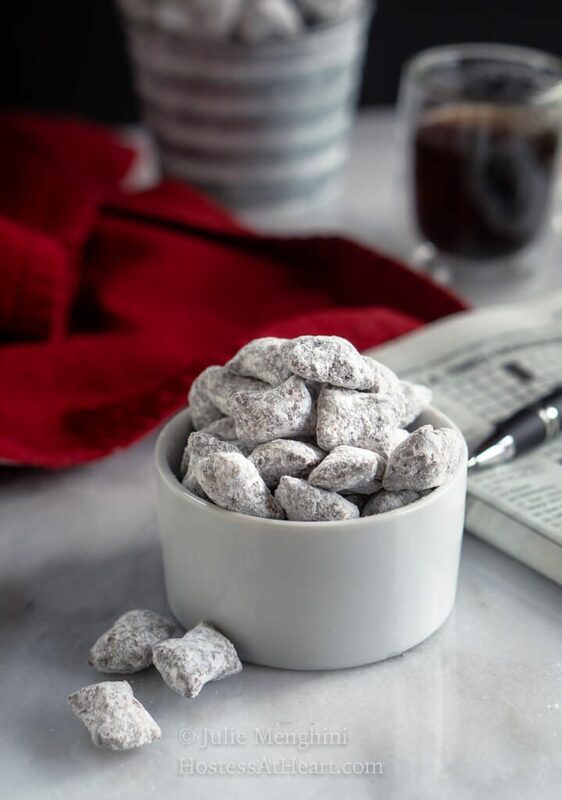 Everyone knows what puppy chow is but little do they know the surprise in this one! It’s addictive though so I only make it around the holidays when I have extra folks around that will help me eat it. Otherwise, I would try to finish off the batch all by myself. I hate to waste food…right. 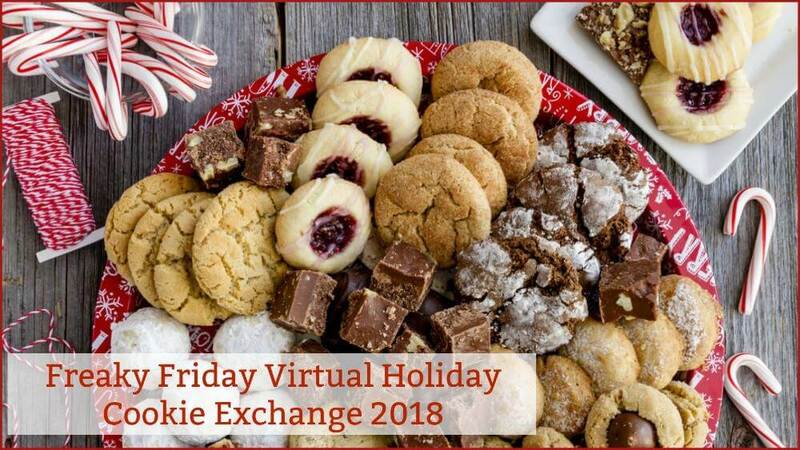 Freaky Friday Annual Virtual Holiday Cookie Exchange arrived just in time. The Freaky Friday blog hop, organized by Michaela who runs An Affair From the Heart, is a group of bloggers that are secretly assigned each others’ blogs from which we choose a recipe appropriate for the theme. The blog that I was given was Take Two Tapas. Take Two Tapas is the brain project of the amazing Jennifer. 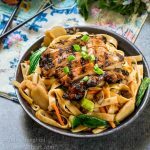 Jennifer started her blog because she enjoyed grazing on several different dishes instead of filling up on one big plate. I’m with her! She enjoys entertaining and is a real magician when it comes to transforming food with big flavors into smaller portions. The only rules for our exchange were the recipe I choose MUST BE a cookie, bar, candy or holiday type chex/snack mix, something you would see on a holiday platter. I had so many things to pick from including her Butterscotch Pretzel Cookies or her Salt River Sticks. Both would escalate my cookie tray to the next level! This Peanut Butter Pretzel Puppy Chow recipe is going to change your puppy chow world. 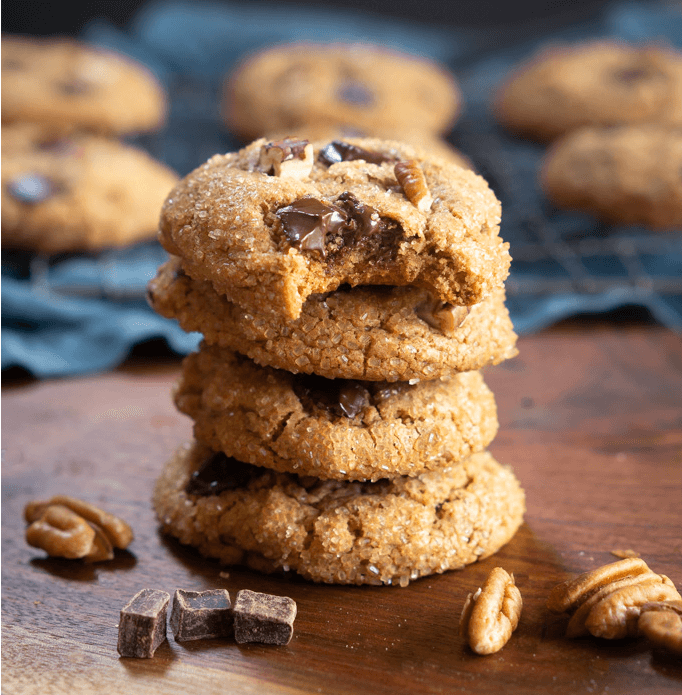 They're sweet, crunchy, and satisfy that peanut butter craving! In a large microwave-safe bowl add the chocolate chips, butterscotch chips, and butter. Microwave in 30-second bursts until the butter and chips are melted, stirring between bursts to prevent burning. Add peanut butter pretzels to the melted chocolate. Stir until the pretzels are equally covered. Add 1/2 cup powdered sugar to two gallon-sized zip-lock bags. Scoop approximately 1/4 cup of chocolate covered pretzel in each bag. Add another 1/2 cup of powdered sugar to each bag. Close tightly and shake until pretzels are coated. Store coated puppy chow in an air-tight container at room temperature. Well, I made this recipe and set it out for a tailgating party we had. It didn’t make it to my Holiday Cookie Exchange. Everyone loved this version because of the nice crunch the pretzel gives you and the sweet-salty contrast is a lot more even. Just go see for yourself all of the amazing recipes on Take Two Tapas. I’ll guarantee you’ll want to stay a while. While you’re at it, take a look at what these other Freaky Friday participants are cooking up! 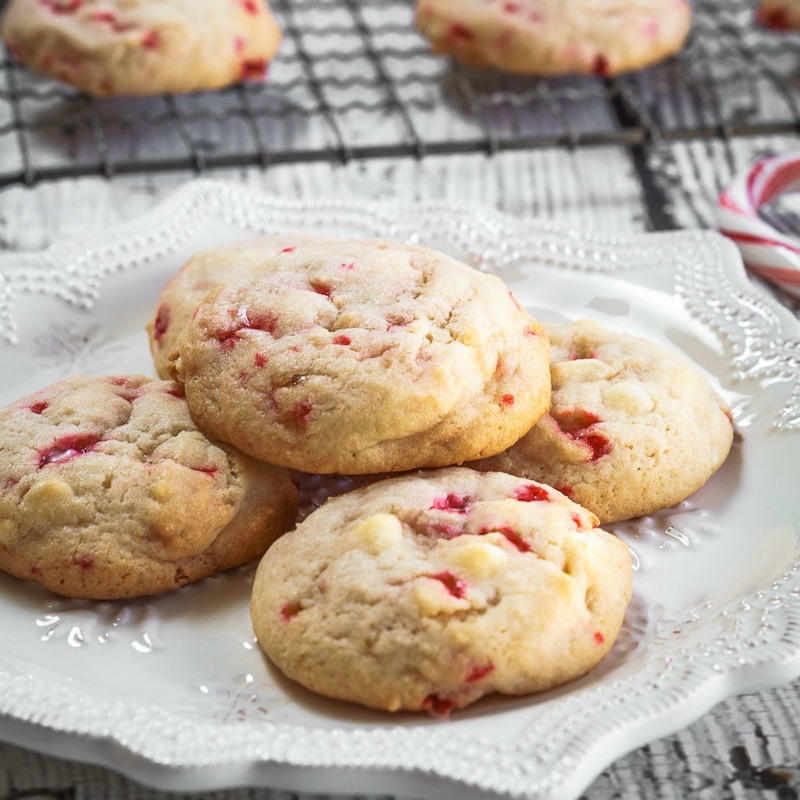 If this isn’t enough inspiration, here are a few more recipes that are perfect for cookie trays! 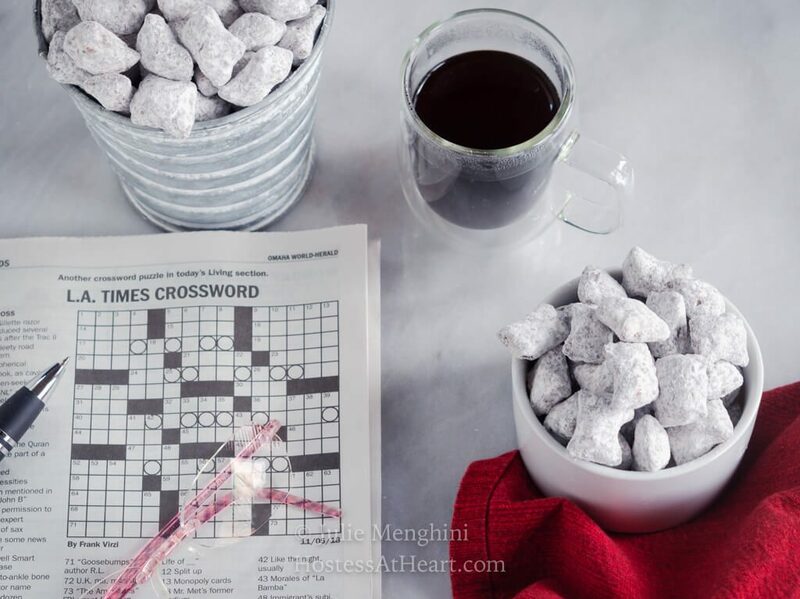 What a clever twist on Puppy Chow!! I can’t wait to try it — AND I have it all on hand! Outstanding! What a great idea for a quick sweet-salty snack fix! Love this one! I am so glad that you liked the recipe! It’s addicting, isn’t it?!?! This was a wonderful recipe Jennifer! I made your turtles too and I think they were wrong before the camera came out. Oh yum!!! I’m not sure that I’ve ever made puppy chow for my younger girls. They’ll love helping me make a couple of batches over the holidays. Thank you, Lori! It is a great recipe for the kiddos to help with. I love this twist on puppy chow! It sounds absolutely addicting! Thank you, Lisa! We really did too and it is addicting! I love setting up a big buffet for snacks for a holiday party and this is so delicious, I know it’s something everyone will love! I gotta get busy to make this snack!! p.s. love how you’ve pictured this with the puzzles – how perfect! Thank you, Debra! I’d love to see your holiday buffet. I bet it’s second to NONE! This was actually the second set of pics I took. The first ones were very monochrome and looked like I took them Black and White. I love the peanut butter in here… how fun this will be to have at a holiday cocktail party! Merry Christmas Julie! 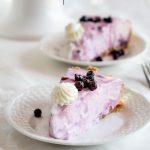 I love connecting with you and and enjoy all of your recipes! Meeting you in my foodie adventure is such a star in the plus column in my life! Thank you so much, Michele! We’ve got to get together again. I’ve really enjoyed getting to know you too and am just in awe of all you do for so many. You’re a peach! 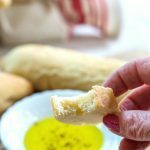 This is such a fun recipe and a great snack! 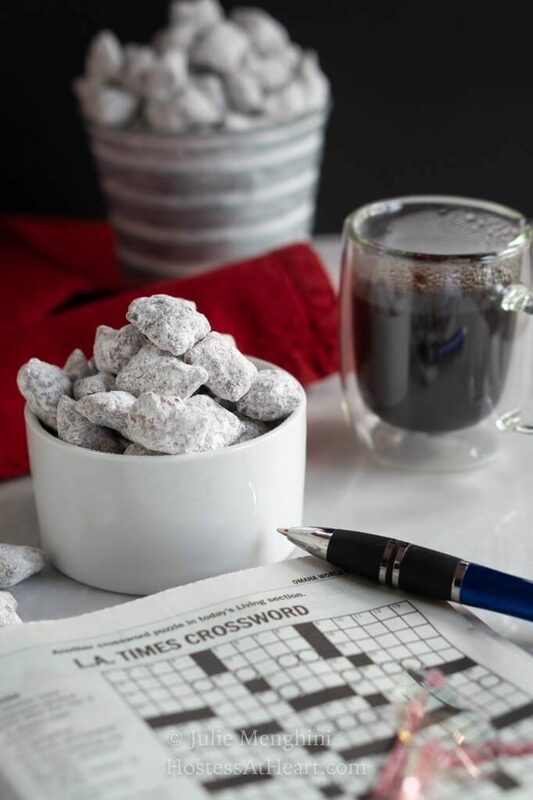 Please pass the coffee, and the crossword puzzle! Thank you, Debi! I love snacking like this in the company of my coffee and paper! P.s. this makes a great hostess gift or treat for neighbors. You’re right! My neighbors love food gifts all year long LOL! Oh yes! This one brings back memories for me too. I would make this for my kids and their friends when they were little. Making this again for them. Even in their 20’s they’ll love digging into a bowl of puppy chow. I can’t believe how long I’ve been making it too Sandra! We really enjoyed this pretzel version too! Puppy chow is my favorite! Everything about this version sounds so tasty! Thank you, Madi! I don’t know why I don’t make it more often! We made this recipe the other day with my friends and loves it! The flavors were awesome! Thank you! Thank you, Shadi! I shared it with friends too and we all loved it! You had me at peanut butter. What a fun bite size snack. 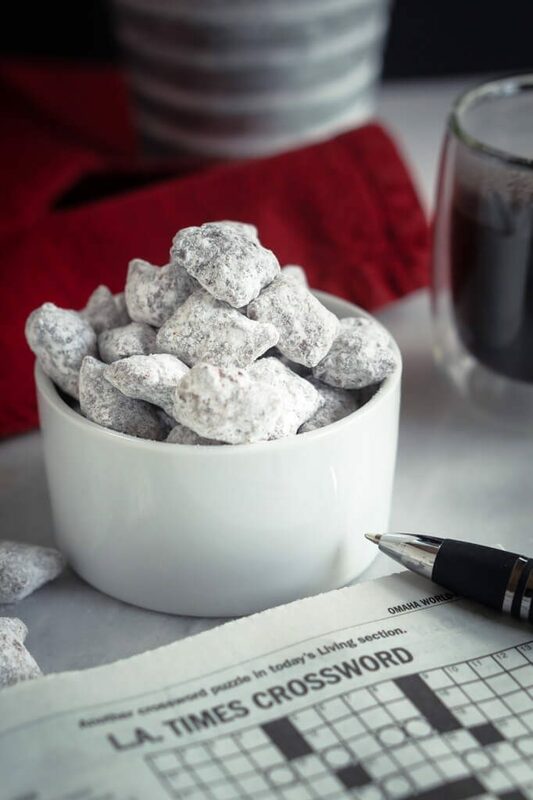 I actually had never heard of puppy chow – I’m on board now! Thank you, Beth! You are the second person that’s not heard of it. Maybe it’s more of a geographical snack I’m not sure but you’ve got to give it a try! Ok Loretta you just made my day. This snack is traditionally made with either crispix or rice chex cereal and it’s called puppy chow because it resembles dog food LOL. I’ve been making the traditional version for 30 years. You’ve got to try it but make sure you have friends to help you eat it because it’s addictive! 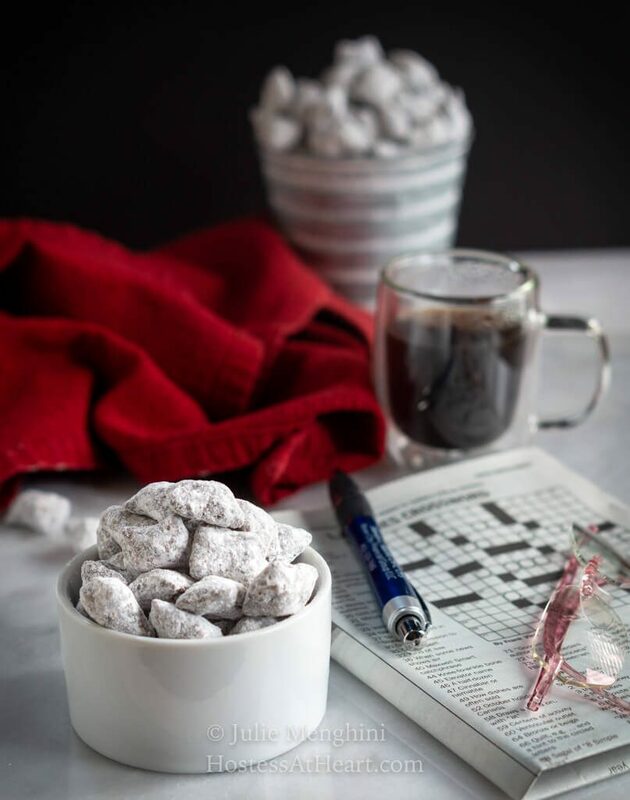 We love all of Jen’s recipes and you have done her proud by your rendition of this delicious looking puppy chow. I can only imagine how addictive this treat is but that would never stop me from indulging! Merry Christmas and wishing you many holiday blessings, Julie, to one of our very favorite online foodie friends!!! Thank you, Dan! My door is always open to you and your “pups” too!